In my last installment I talked about how the Anaheim Ducks were selling CCM “old-style” cut jerseys to the public and not making available the Reebok Edge style cut jerseys the players wore on the ice. This is not an isolated incident and I thought it would be a good idea to examine some examples. We’ll look at teams that didn’t give us copies of the on ice product and other examples when they did give us true replicas. I’ll begin with what I believe to be the first (and most atrocious) example, the 2008 Buffalo Sabres Winter Classic sweater. 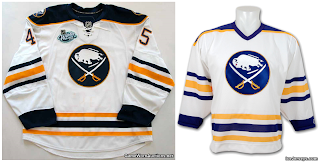 The Sabres took to the ice in a white retro jersey that utilized the new Edge cut. That jersey had the Winter Classic patch and collar laces. It looked excellent! What was sold to the public was the old style cut jersey with Reebok branding. Not included on this jersey were the Winter Classic patch and the collar laces. 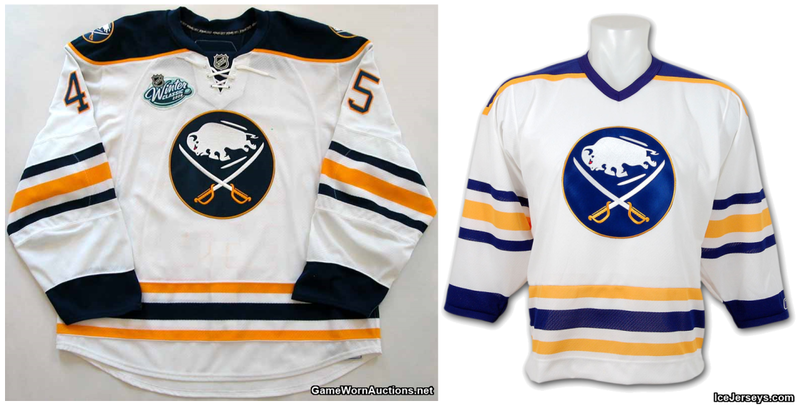 Not to mention that the shades of blue were different from the on-ice jerseys to the replica in stores! Staying outdoors, the Montreal Canadiens 2011 Heritage Classic jersey was a big letdown, design wise. They used their regular road white jersey, but removed the inner white outline from the player numbers. The Heritage Classic event patch (French version) was then sewn on. You would think that could be quite easy to replicate. Apparently not, as what the fans got was some sort of Frankenstein jersey that had never been worn in any era, EVER! It was CCM cut, with the NHL shield floating just below the collar and just above the Habs’ logo. Who would want this? Not one famous Hall of Famer has ever worn that jersey! 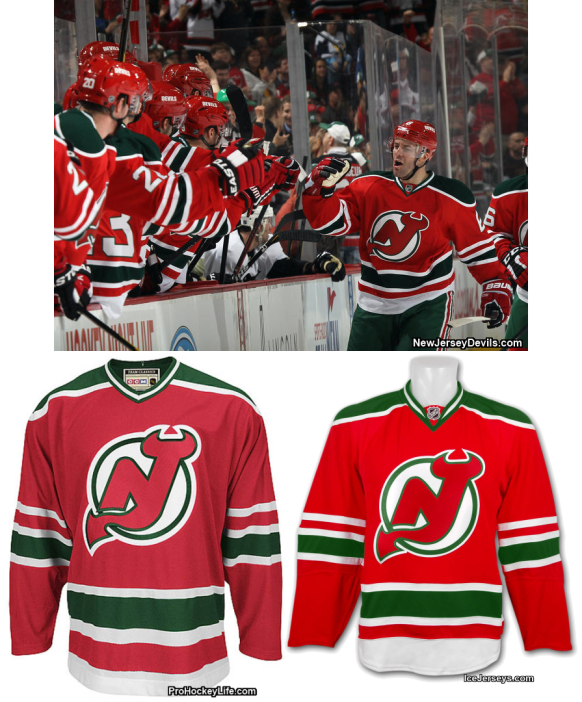 The New Jersey Devils have been downright belligerent when it comes to anything but a home and away sweater. That added to the novelty of their St. Patrick’s Day retro jerseys. 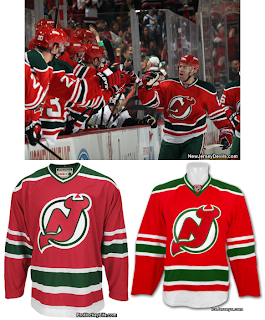 The Devils wore an Edge version of their old red sweaters. What fans got was a straight forward, classic cut red jersey. Hey Reebok, I already bought that jersey 20 years ago! I want the updated one the players are wearing! Actually, a small number of authentic red Edge sweaters were released. One of them could have been yours for $300, if you were able to find one. It doesn’t always go wrong though. Let’s take a look at three teams that got it right! 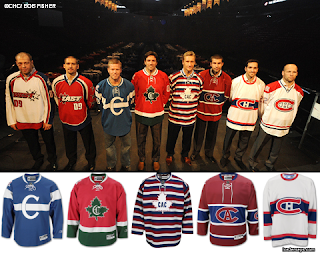 We talked about the Canadiens’ failure with their Heritage Classic jersey. That may be attributed to the two previous seasons when the Habs celebrated their 100th anniversary. For the occasion, they wore and sold five different retro jerseys. Three of them used the Reebok Edge cut, one used the old CCM cut, and one used a hybrid of the two. Fans who wanted these sweaters were able to purchase replicas of all five. The jerseys that were Edge cut were sold as Edge jerseys! The CCM cut jersey was sold as a CCM cut jersey. They hybrid jersey was just that, a hybrid! 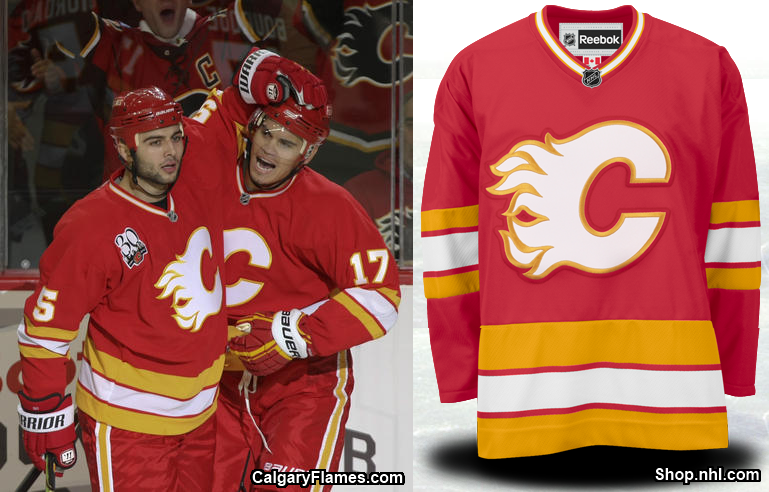 When the Calgary Flames celebrated their 30th anniversary they did so with a retro jersey. The jersey worn on ice was an old CCM cut jersey, which was interesting because this was during the Reebok Edge era. The jersey wasn’t quite a hybrid, but the NHL shield was pasted to the collar instead of being stitched to a collar insert. 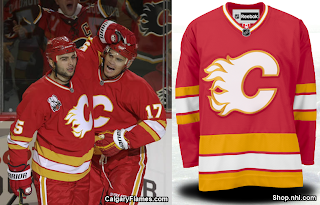 Fans that purchased the jersey were treated to a near exact copy of the jersey the Flames were wearing (replicas are NEVER the exact same as the on ice product). During the 2013 lockout shortened season, the Vancouver Canucks acknowledged 100 years of pro hockey in Van-city. They wore Reebok Edge versions of the Vancouver Millionaires’ sweater. Fans that were lucky enough to get their hands on the rare replica sweaters got an accurate copy of the sweater being worn by the Sedins, Burrows, Kesler, etc. 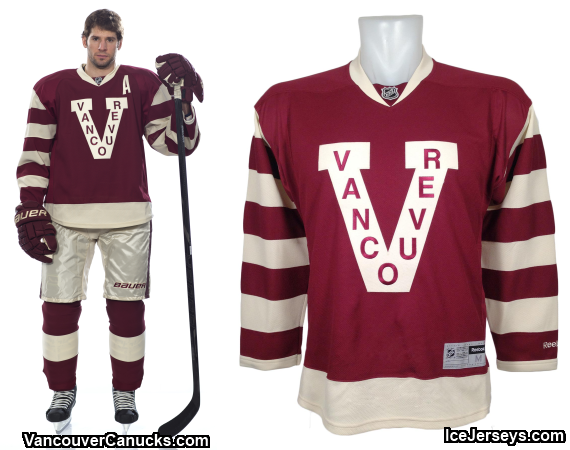 This situation was the ideal recipe for Reebok and the Canucks to hand us a CCM cut Millionaires jersey. They surprised us with an Edge replica and to those who do have one, hang on to it! As time goes on that initial release will just continue to gain value.